New Facebook Users Asked To Submit Aadhaar Verified Name! Aadhaar Invades Facebook – New Users Asked To Submit Aadhaar Verified Name! Aadhaar has officially invaded Facebook, and very soon, every social media portal can be in the grip of it. In the month of April this year, we had published a satirical post, wherein we had created a scenario where every Google search, Facebook account and Tinder swipe was linked with Aadhaar. We had never imagined that this will become true within 9 months. Facebook has confirmed this development. Aadhaar Verified Name For Facebook: Not A Satire Anymore! 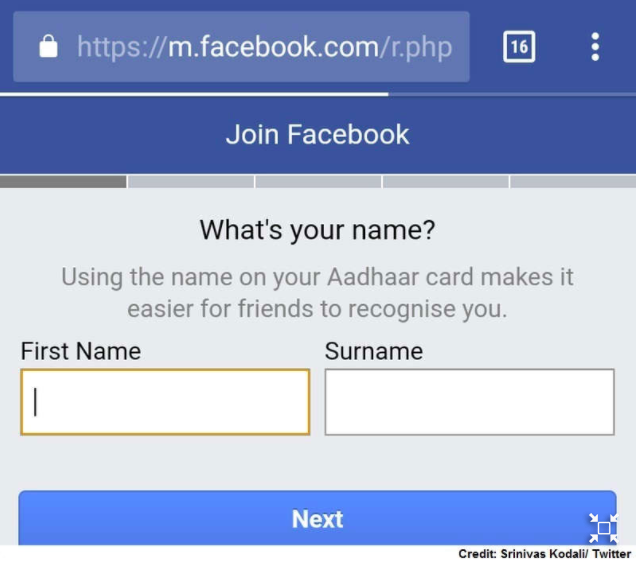 New users, who are trying to open a new Facebook account, are now prompted with a message ‘asking’ them to enter their Aadhaar name in the field where the users are supposed to enter their name. This was first discovered by a Reddit India, and soon the news spread everywhere. Note here, that not every new user is being shown this prompt. Facebook: Yes, Aadhaar Age Is Here! Facebook has confirmed that this new reality. In a statement, Facebook has said that this part of a new ‘experiment’, and few users who are trying to sign up with Facebook are being prompted with Aadhaar based naming. We should feel lucky that Facebook is not asking to enter Aadhaar number for creating a new account, but nonetheless, this is a big, massive move to link Aadhaar with social media. And this news becomes even more important because right now, India is Facebook’s largest market with 241 million active users. Do you think a scenario can emerge wherein Facebook asks everyone to link their Aadhaar number with their account, or else the account would be deactivated? Do you think other social media portals like Twitter, Linkedin, Instagram, Whatsapp can also jump into the Aadhaar mode, and replicate what Facebook is doing? Do you think Aadhaar will officially invade every social media and website in the future? "Aadhaar Invades Facebook - New Users Asked To Submit Aadhaar Verified Name! ", 5 out of 5 based on 1 ratings. …And so should everyone else, Santokh! Should never have HAD them in the 1st place! I will delete my Facebook account if Facebook asks for adhaar . If linkedin oes so then I will delete my account there also .